NIAID investigators and colleagues from Columbia University Medical Center and St. George’s University of London have charted the emergence of a new strain of Staphylococcus aureus (S. aureus) bacteria that transmits efficiently among humans. Scientists have determined that this new strain primarily infects the skin and soft tissue, but it can cause more severe disease. A methicillin-resistant S. aureus (MRSA) strain known as livestock-associated (LA)-ST398 is a cause of severe infections in people in Europe who have close contact with swine, but the bacterium does not transmit well from person to person. More recently, a variant of LA-ST398 that presently is susceptible to methicillin has emerged as a significant cause of human infections in several countries, including the United States, Canada and China. The new strain, named ST398-NM, has adapted to transmit more easily among humans. 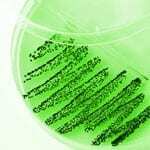 By analyzing and comparing the genomes of LA-ST398 and ST398-NM, the study, led by Anne-Catrin Uhlemann, M.D., Ph.D., at Columbia, charted several ways in which the bacterium has adapted to its hosts. For example, they learned that the human-adapted strain ST398-NM contains human-specific immune evasion genes, whereas the livestock-adapted strain does not. They also found that ST398-NM adheres well to human skin, thus increasing its ability to colonize and infect people. The study authors say it is possible that the emerging ST398-NM strain could acquire genes making it resistant to methicillin. Scientists at the NIH National Institute of Allergy and Infectious Diseases and their colleagues plan to continue global surveillance of the strain, paying close attention to its molecular adaptations. This new study further underscores the need for vigilance in surveillance and detection of S. aureus.